This was never going to be the most important match this month for Manchester City, irrespective that it was the first leg of a semi-final. This Carabao Cup tie against Burton Albion paled in significance compared to last week’s tussle against Liverpool in the Premier League and the forthcoming test against Wolverhampton Wanderers. Though thanks to the 9-0 scoreline the return leg in two weeks time was made redundant. City were far supreme here, growing more and more clinical as the match progressed. Burton held on for as long as they could but once the game – and tie – escaped them, there was no coming back. Pep Guardiola’s message in his press conference on Tuesday afternoon was that this tie was not the priority, but it was better to win it than to not. A comprehensive victory here would all but ensure another trip to Wembley for City, which for a club who didn’t reach a semi-final from 1981 to 2009 should not be shirked. That was telling in the starting line-up which Guardiola chose; there were four changes from the emphatic win over Rotherham United on Sunday with young Kosovan goalkeeper Arijanet Muric, who started the season on loan at NAC Breda, along with Eric Garcia, Leroy Sane and David Silva coming into the XI. Burton came into the match in good form and on the back of four games unbeaten, however, this is the League Cup not the league and the difference was telling. As with Guardiola’s words, it was clear early on that this was going to be one of those games that the crowd were going to wait to be entertained rather than pre-empting it, they were soon to be revelling in enjoyment. It didn’t take long. With five minutes of all hands to the pump as far as Burton were concerned, David Silva dinked a ball to Kevin De Bruyne in the penalty area, who had ran from deep and was afforded too much space in between Reece Hutchinson and Ben Turner. The Belgian’s header past Bradley Collins set City’s win in motion. City’s pressure didn’t relent thereafter. A piece of quick one-touch build-up play ended with De Bruyne guiding a lovely through ball for Sane to run onto following a give and go, Collins was swift off his line and managed to reach the ball first. 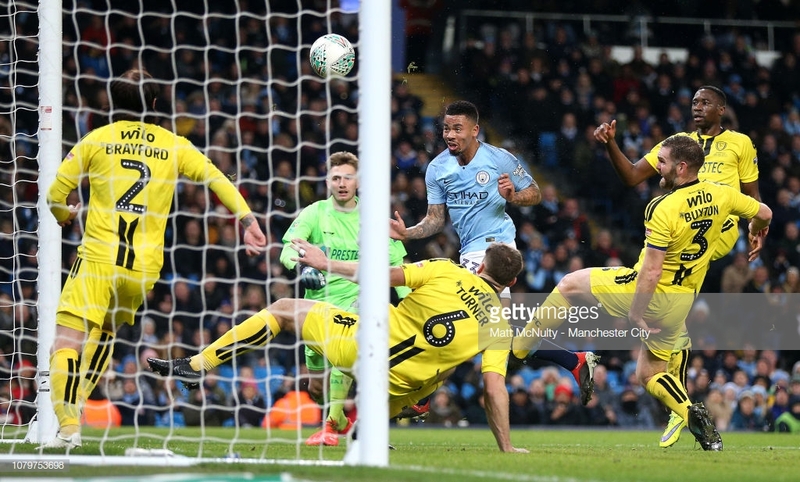 It was as expected, Burton were forced back into a flat back five with Sane and Riyad Mahrez heavily preoccupying the minds of both wingbacks; Oleksandr Zinchenko and Kyle Walker devoured the space which that afforded them to run into. Burton did venture forward for a rare attack and it presented a goalscoring chance that the visitors should have done better with. The play built up on the left side, attracting much of the City defence, allowing Marcus Harness to control the cross that had been sent over them all but he lifted his shot over the crossbar. This tie will feature few better chances than that for Burton and at 1-0 it felt like an opportunity squandered. City, though, remained in control – not pressing aggressively and willing to invite the visitors to come onto them when in possession, but countering quickly. If the first half an hour had been a test for Burton, then the following 10 minutes certainly quelled any confidence that was growing amongst their ranks. Firstly came a quick give and go on the edge of the Burton area, Sane was not tracked by Lucas Akins and the City attacker was able to lift the ball towards goal. Gabriel Jesus was there, no more than three feet from goal, to head into the net. Four minutes later came City’s third; Ilkay Gundogan fed a high ball to Silva who managed to stay onside and played the ball back for Jesus to finish. There was a momentary pause as VAR checked that none of Silva’s body parts were beyond the last defender, but soon enough the City players were running back to the halfway line with their opponents sullenly trudging behind them. A miscued Zinchenko cross brought another goal for City before half time, it travelled from the Ukrainian’s left boot straight into the top corner of Collins’ goal. He was in as much disbelief as those around him. There was a penalty shout when Mahrez was slightly clipped by Turner, but it was deemed unwarranted of a spot-kick by VAR. A half which Burton had seemingly been dealing with fairly well had gotten away from them in spectacular fashion; Guardiola’s aim of putting this to bed on the night was coming true. De Bruyne was substituted early in the second half to afford him a rest and more first team minutes to Phil Foden. Jesus was able to complete his hat-trick with another header, Silva – as ever – created it with intricate play before releasing Mahrez who crossed the ball towards Jesus. There were few signs of sympathy from City and it all became a bit embarrassing for Clough’s side, but then when City are this good – so slick, incisive and confident – then few teams escape the torture. Foden swiped in the 6th, Jesus slotted the 7th, Walker placed the 8th whilst Mahrez poked in the 9th. Muric down the other end could only applaud. The Burton supporters behind his goal probably felt like joining in. Naturally, this competition is fourth in terms of priority on City’s list of ambitions this season, and although Guardiola was clear about that, he still wanted to take this seriously. A 9-0 scoreline farcically highlighted the disparity between the two sides and, best of all for Guardiola, it means that the second leg is a formality, a chance to deploy youngsters; how Tottenham and Chelsea must wish to be afforded the luxury of a final place after only the first leg. One could argue that a quadruple has never been closer for City; their past three performances have certainly underlined their credentials on three of those fronts. After a wobble in the Premier League in early December, Guardiola’s side are clearly finding their feet again and the road ahead looks encouraging. The determined performance against Liverpool and the exuberant performances on Saturday and here show that City are fighting on all fronts with a range of virtues.